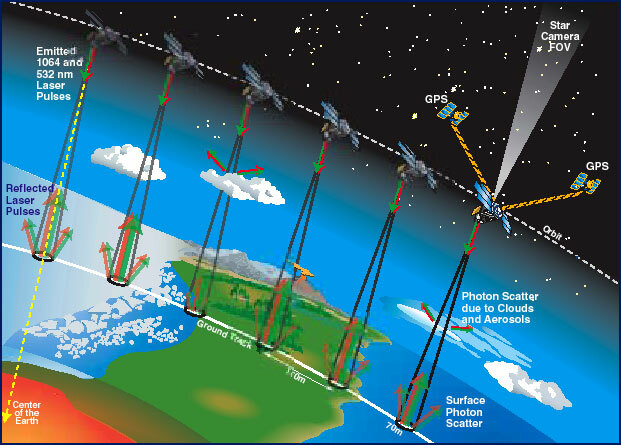 The Geoscience Laser Altimeter System (GLAS) instrument on ICESat will determine the distance from the satellite to the Earth's surface and to intervening clouds and aerosols. It will do this by precisely measuring the time it takes for a short pulse of laser light to travel to the reflecting object and return to the satellite. Although surveyors routinely use laser methods, the challenge for ICESat is to perform the measurement 40 times a second from a platform moving 26,000 km (16,000 mi) per hour. In addition, ICESat will be 600 km above the Earth and the precise locations of the satellite in space and the laser beam on the surface below must be determined at the same time. The GLAS instrument on ICESat will measure precisely how long it takes for photons from a laser to pass through the atmosphere, reflect off the surface or clouds, return through the atmosphere, collect in the GLAS telescope, and trigger photon detectors. After halving the total travel time and applying corrections for the speed of light through the atmosphere, the distance from ICESat to the laser footprint on Earth's surface will be known. When each pulse is fired, ICESat will collect data for calculating exactly where it is in space using GPS (Global Positioning System) receivers. The angle at which the laser beam points relative to stars and the center of the Earth will be measured precisely with a startracking camera that is integral to GLAS. The data on the distance to the laser footprint on the surface, the position of the satellite in space, and the pointing of the laser are all combined to calculate the elevation and position of each point measurement on the Earth. Schematic illustration of the GLAS instrument making measurement from ICESat while orbiting the Earth.Graphic by Deborah McLean.